Do you require the skills of a highly trained residential locksmith to help you with a broken key extraction? If so, we are the company for you! We are Pros On Call and we assist customers seeking a mobile locksmith’s help on short notice. We are available for you 24/7 and we guarantee upfront prices no matter what time of day you call. When you need help with a stuck or broken key, just give us a call and one of our friendly and licensed technicians will arrive at your location in no more than half an hour. And don’t forget, we can repair or replace all types of locks including deadbolts, mortise locks, profile cylinders, and so much more. Contact Pros On Call today to learn more or to request our emergency locksmith services. We are Pros On Call and we assist customers seeking a mobile locksmith’s help on short notice. We perform a variety of services, including residential broken key removal, repair, and replacements. When your household needs the talents of a well-qualified emergency locksmith, call us! We hope you select us as your preferred 24-hour locksmith provider. We offer full installation and repair services for a variety of stuck or broken key situations. Our fully licensed, bonded and insured company maintains a loyal following of customers. When you need a locksmith on a 24/7/365 basis, you can count on us. Our highly trained experts respond to requests for our assistance within 30 minutes (or less). You’ll enjoy fast, responsive service when you contact us. 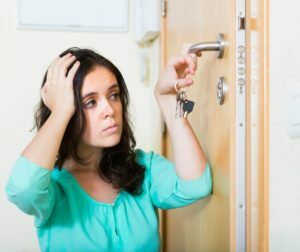 You can depend on our firm to provide fast, accurate solutions to a variety of problems involving residential keys and locks. For example, if you cannot open a door in your home because the key unexpectedly shattered inside the lock, we can help you remove the broken metal fragments without damaging the lock mechanism. Then, we can get you a new key right then and there! Did you know, keys break inside locks more frequently than many people realize? Lock and keys have changed over the centuries, as locksmithing technology improved. Yet just like any other mechanical part, with heavy use, a metal key will eventually wear out. And your key is more likely to get stuck or break if you use your keys for uses other than what they are intended for such as opening a package. Using the wrong key by accident and trying to force it in the lock is another common cause of broken keys. Today the most popular types of keys include tumbler lock keys, especially standard pin tumbler lock keys. When one of these keys contains deep cuts, stresses sometimes develop between the bow and shoulder areas and the rest of the key. Repeatedly opening a door by pressing the turning key instead of the door handle can eventually result in damage to the key, for instance. But don’t worry! With our complete range of lock services, we can provide broken key extractions for just about any type of lock on the market. We offer comprehensive broken house key services, including key removal and broken key replacement. Typically, replacement proves more cost-effective than broken key repair, although we do offer key repair under some circumstances. What should you do if your house key shatters in the lock? In most situations, calling us for skilled extraction assistance represents the best solution. Improperly extracted keys can sometimes damage lock mechanisms, particularly if small pieces of metal jam inside the lock. In such cases where your lock does sustain damage due to a jammed key, you can always count on our quick and affordable lock replacement solutions. Whenever you require the assistance of a capable local locksmith, think of Pros On Call. Our skilled technicians offer a full range of installation and repair services, including broken key removal and lock repair or replacement. We value your business. Call us to schedule an appointment for locksmith services, or to obtain assistance now from an emergency locksmith. Broken Key Extraction https://prosoncall.com/locksmith/residential/broken-key/ 4.0/5 based upon 10 reviews.